Wessels type TXA thermal expansion tanks are designed for use on potable hot water systems to absorb expanded water and prevent the dangerous buildup of pressure. As the water is heated, thermal expansion occurs the water is forced into the precharged thermal tank. The precharged air cushion returns water to system when delivery is required at various fixtures. This arrangement prevents unnecessary relief valve operation, which results in wasted water and energy costs, and eliminates potential internal component damage to water heaters. All Wessels thermal tanks come equipped with removable, heavy duty Butyl diaphragms and a stainless steel system connection. Wessels thermal tanks are used for residential, institutional, industrial and commercial applications. Were you looking for a non-replaceable thermal bladder tank? 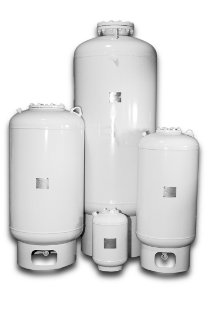 The TXA bladder style tanks boast many advantages over other style thermal expansion tanks. The TX Series tanks are designed for use in low pressure residential systems and in light commercial systems where ASME construction is not required.